Alrighty, this is one of my favourite times of the year because this means beauty exclusives GALORE. It seems like all the big brands bring out the big guns, and this year is no exception. I’m going to do this by brand, so if you have a particular brand you’re looking for scroll down and you may (or may not) find it. 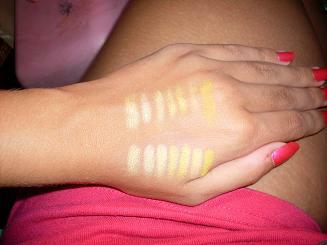 As promised, I bring you swatches of yellows! They were applied with the mark eyeliner brush, which is a short pointy pencil-tip brush, comparable to MAC’s 219. 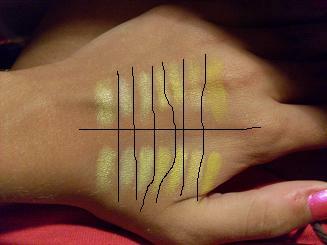 The top row is applied with no base, and the bottom is applied over Urban Decay Primer Potion. The first one is with no flash, I believe the second one does have flash, and the macro function is used for all. The nails are OPI Pompeii Purple, and the pink case? Where my lippies reside when not on active duty. For many years, TJ Maxx was a place I frequented a lot. The fashions were fairly inexpensive, I could get my preferred thong underwear for $2 a pair (lesson learned: Buy VS Cotton v-strings), and it was a very non-intimidating atmosphere. However, fashion-wise, many of the items were, well, things I would not touch. They were either so overly trendy that they would have no place in my wardrobe, which does follow trends but has to stay relatively timeless, or they were “urban brands”-Baby Phat, Apple Bottoms, JLO (thank God that folded), and their ilk. So I stayed away. What you may not know though is that they are a top destination for discounted beauty as well. I have heard of some stores getting in NARS, but I didn’t see any of that. However, there are insane bargains to be had here, and they are consistently bringing in more high-end stuff at lower prices. Saving money=always good! On the makeup side, at one of the stores I went to they just had a few Essie polishes and then some ModelCo stuff. Nothing particularly great, although there were single shadows, and today, they had these lipstick/tooth whitener duos marked down to $3. I don’t have cash for discretionary spending at this time, however it’s a fun thing. They had an UD Sparkler pen for $2, although it was missing a cap. No thanks! At the store by the mall I used to work at, however, they had a ton of Lancome. There was Avant Gold and another couple shadows, for $6 each. They also had Artliners and then a few face products, as well as a little sampler of Juicy Tubes. There was some Paula Dorf (a wallet with a little lip palette) and then some Jaqua glosses (as in, Raspberry Buttercream Frosting, my favourite scent ever seemingly), the latter of which were a whopping $4. Elizabeth Arden had a lot of things there too, including the 8 Hour Cream for $15. Yep, it’s their GWP time again! This is probably one of the most insane GWP’s I’ve seen them do, so you may want to pay attention. This time, it’s all about choices. Your bag? You get to choose between red, black, and blue-a vinyl oval-shaped bag with a special Lancome print on it. It’s also got a handle, so it could double as a purse in a pinch. Your lipstick? Apparently you get to pick two. Yes, two. It does not say the shade names, however this is one that would be good as the lipsticks make great stocking stuffers. Your compact? You can choose between the ubiquitous eye quad…OR get a blush duo! The blush duo, unfortunately, has little stripes of blusher which to me are absolutely useless. However if you don’t need another eye quad, this is a good way to go! This starts next Friday, for the Anniversary sale, but I figured I would post these ASAP! Alrighty, Nordstrom is now letting you pre-order the exclusive items for the Anniversary sale. If you are uninitiated to it, the anniversary sale is HUGE. We’re talking exclusive collections, value sizes, you name it! This post is going to be dedicated to cosmetics. First up, Bobbi Brown has her “Best of Bobbi” set. It retails for $75, and features a 7-colour lip palette, a two pan shadow palette, a full-size gel eyeliner, a mini mascara, and a mini double-ended brush (eyeliner/eyeshadow fluff). While not a palette for people who like brights, this is a very good Christmas present for someone who prefers more neutral colours, or needs makeup that can go from day to night very easily. All the lip shades are muted roses and pinks, and the eye shades are a champagne and then a grey. Best of Sephora: New Sets! Sephora, for a long time, has made several different value sets, in which you could buy sets of trial and sample sizes of everything from perfume to mascara, in order to help pick out your favourite items. There have been everything from the Lash Stashes (many different mascaras) to perfume ones where you buy a bunch of sample vials and an atomizer, and you get a coupon to pick your favourite of the 10 to get in a full size! Well on the 17th of this month, there are ten new sets coming out, and trust me, YOU WANT THEM.